nice storage - where did you find the ladder? where is the cover for the toe kick heater from? Any staining issues on floor? - Have you had any staining issues with the Shanxi Black Granite Floor? I installed it in a bathroom sealed it four times and am having staining spots. What did you seal with? Thanks! Did you purchase the poultice or make it yourself? Brand? Thanks! I don't have a brand name, but a local tile shop would be able to supply you with one. is the floor porceline tile if so what shade?? The floor tile is flamed granite black in a mini Versailles pattern. There is a floor warming system underneath. I really like this toe kick drawer so how deep and wide do they come i - I'm doing a redo of my kitchen and this can answer one of my questions about where will I store my ladder. A handy step stool. It's always great to have a leg up for extra-high upper cabinetry, but where on earth should you store the step stool? An ultrathin model can slip right inside a discreet drawer. This homeowner managed to sneak one inside a toe kick. 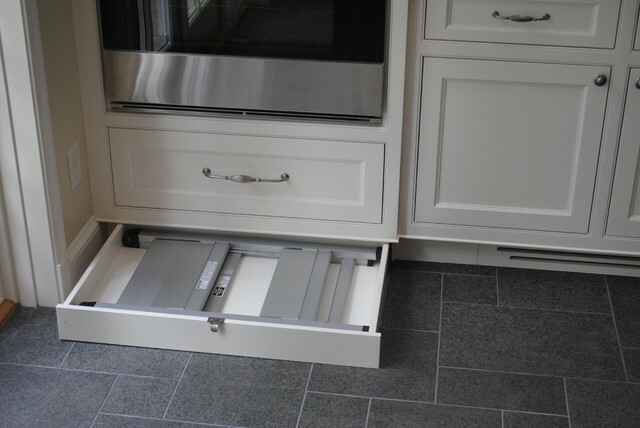 A specialized step stool drawer like this is offered by many cabinetry manufacturers — if you're designing a new kitchen, don't forget to ask about this feature. To eke out storage in every last corner of your kitchen, utilize the space under the cabinets with kick drawers. (They’re tucked in behind the cabinet’s toe kick.) This one hides a folding step stool to reach those high shelves, but you could also use this space to hold trays or cookie sheets. … or a stepladder for when you need to reach those tall upper cabinets. Step ladder in toe kick to get to high cabinets.